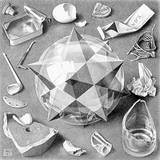 ~ For my (environmentally-aware) puzzle fans: what is shown in the picture below? Well, sure, it's a variegated bunch of mostly small shards of stuff. Want a hint? It's almost all plastic. Well, it should be food for thought for us humans, but it is actually bits of plastic mistaken as food by a single sea turtle, and a juvenile turtle at that. The picture shows the contents of the turtle's stomach, extracted during a post-mortem. Many of the pieces are sharp, and it is depressingly common for turtles and other marine life to die from perforated bowels, intestinal blockages and other complications from eating this indigestible marine pollution. Humans currently produce 260 million tons of plastic a year. 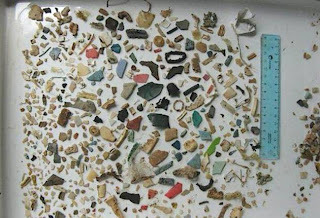 When those products are pulled into the sea's currents, the plastics do not biodegrade but are broken into smaller pieces which are consumed by marine life at the bottom of the food chain. 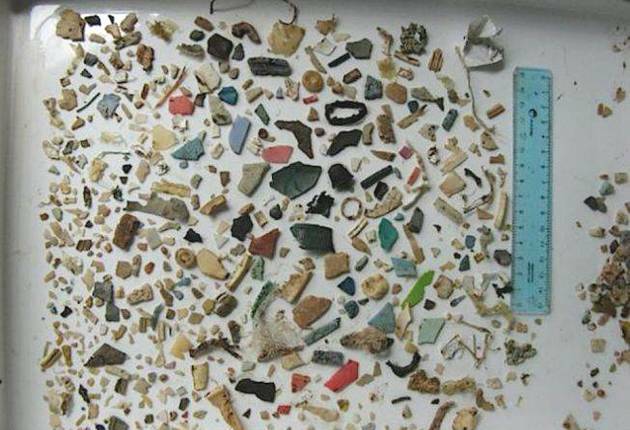 An examination of gastrointestinal obstruction in a green turtle found off Florida discovered that, over the course of a month, the animal's faeces had contained 74 foreign objects, including "four types of latex balloons, different types of hard plastic, a piece of carpet-like material and two 2-4mm tar balls." Sadly, it is our own carelessness that fills the ocean with this dross, killing not just turtles, but many other species as well. Plastic, when exposed to sun and sea becomes brittle and fragments into ever-smaller pieces. Many of these pieces, after being eaten by sea-life, become incorporated in tissues throughout their bodies. Perched at the top of the food chain, we enjoy seafood of many kinds, most of which have eaten microscopic bits of plastic. So when we enjoy fresh fish, we too are likely also eating plastic. We may not be dying from it, but ingesting such things as BPA and pthalates sure aren't healthy.